Thanks, everyone, for all your wonderfully supportive and encouraging comments about the osteopenia diagnosis. I’ve been boning up on the topic (sorry-ouch) and have some great recipe ideas to share in the next while (and even one today). I’ll also get to my responses asap. . . sorry I’ve fallen behind a bit! Hmmn. I SO hate it when he’s right. “Well, how about this, smarty pants?” I countered. “I went grocery shopping today and I spontaneously bought these overripe tomatoes on sale, even though I had no specific plans to cook anything with them.” Touché! Foiled again. But did he have to look so darned smug about it? Well, this past weekend, I am proud to say, I did manage some spontaneous fun. My friend Eternal Optimist rang me late Friday afternoon with an invitation for the HH and me to attend a show at the local Yuk Yuk’s Comedy Club–to which she just happened to have free passes! Well, without a second’s hesitation, I told her, “Um, I’ll just have to call and check with the HH to be sure he hasn’t booked anything else. Oh, and then I’ll have to walk The Girls. Oh, and feed them. Oh, yeah, and after that, I’ll just finish cooking tonight’s dinner before I wrap up a few things for work–but hey, if I can manage to get all that done before the show tonight, then heck, YEAH! I’M THERE!” Whoo-hoo! I love this unfussy, impromptu, last-minute socializing! “Okay,” Jackie challenged, “If you two come out right now as you are, the donuts and coffee are our treat. ” Had we heard correctly? TREAT? No matter that our garb at the moment was our flannel nighties; no matter that it was 11:15 PM; FREE donuts? FREE coffee? We flung a blanket round our shoulders and hopped in the car! Once there, of course, the rules changed (these were, after all, seventeen year-old boys.) “Okay, we’ll still treat you,” Gary announced, “but you have to go in there without us and buy the donuts.” In our nighties. With a blanket wrapped around us. Would we possibly be that gullible? Well, we were, after all, seventeen year-old girls. I’m sure you’ve guessed the end of the story. The second we exited the car–scree-eech!–they were off like–well, like two seventeen year-old boys in their father’s car. And we were left abandoned, streetlights trained on us like the spotlight at a prison lineup, at 11:30 at night, in the middle of Dunkin Donuts’ parking lot, wearing flannel nighties and a blankie. So you see why I’m perhaps a bit spontaneity-shy these days. Despite my adolescent trauma, I did end up joining the EO on Friday–solo, as it turned out, since the HH was felled by a major cold and didn’t feel up to it. It was actually a most enjoyable evening: the show was hilarious and I really appreciated being able to share some long overdue “Gal Time” with my buddy. 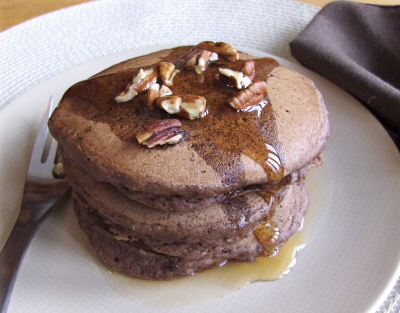 This morning, browsing through my Google Reader subscriptions, I came across this mention of Dreena Burton’s Carob Pancakes on Trust My Intuition’s blog. The description of these was so enticing that I decided–entirely extemporaneously!–to whip up a batch of my own devising. I vaguely remembered learning in nutrition school that carob is (surprisingly) high in calcium; so, with my newfound attraction to all things spine-supporting, I threw together a combination that was both appealing and brimming with bone building nutrients. The resulting pancakes were extraordinarily light and fluffy, with a cakelike texture (versus the sometimes damp, heavy griddle cakes you’re served in restaurants). Carob on its own is slightly sweet, so you may not feel the need for maple syrup on these; in fact, we had ours with syrup, and I could easily have omitted it (if you spread with almond butter instead, you’d be adding even MORE calcium!). The carob flavor is subtle and melds beautifully with the soft pockets of sticky, luscious date. (and don’t worry–even if your dates are stiff to begin with, the cooking process will soften them). For nutritional info, see my calculations after the recipe instructions. I may not be having dinner in Paris any time soon, but here in Toronto, these made one very delicious–and spontaneous–breakfast. One that would beat Dunkin Donuts, any day. Feel free to change the fruits in these cakes if you prefer something else. Next time, I’ll likely make these with chopped prunes, as I’ve been told they’re also good for improving bone health (thanks, Andrea!) P.S. When I said these are light and fluffy, I meant it–that’s only 3 pancakes in the photo, above! The extra calcium is such an incentive to consume more carob especially in the form of a pancake! That stack of pancakes looks heavenly! CAROB!!! DATES!!! You’ve won ME over with those pancakes, for sure; and hooray for higher calcium! I’ve been reading your blog and am always amused by your posts and the dogs… (My cat rules my blog). Those pancakes look delicious – I’ll have to try them next weekend for my weekly pancake fix. Yum. I always think I need to be more spontaneous as well… carob and date pancakes for breakfast sounds spontanous and exciting (not to mention delicious) to me! please, make me breakfast soon? fankoo. Throwning caution to the wind (so to speak) I made your awsome raw bars- and, because it was unplanned, I didn’t check to be sure I had all ingredients, and replaced the dried cherries with, get this, prunes! They were amazing, super sweet (didn’t put any agave), and held together really well. I hope to post on them- linking you- soon. I am a bit late but I only wanted to let you know that I am very sorry to hear about your diagnosis. It’s so great that you share your delicious and calcium rich recipes with us. I instantly need to buy a new box of carob! Dreena’s carob pancakes are really good! Yours came out so well — I love how thick and fluffy they are, and the dates must have been awesome in them. I’m really enjoying your use of dried fruit lately! I usually always have some on hand. In fact, I think I’ve been eating more dried fruit than fresh lately. Another winning recipe. Terrible, terrible pun… but you made up for it with the gorgeous pancake photo! For a sample of those pancakes, I’d happily change my name to the Carob-covered Vegan! Yum–I love dates and spelt…I am going to have to plan to make these soon! Although I did not have an experience like yours (I cannot believe that! ), I am definitely the least spontaneous person I know. In fact, it is a family joke how un-spontaneous I am! By the way, I made your lara bar bites (sorry, I can’t remember what you called them exactly!) over the weekend (as planned), and they are amazingly addictive! Wow. I think the co-op people are going to start calling me the crazy date nut girl because I have been back twice since Saturday to buy more of each to make more treats! Thanks for the awesome recipes! I am so impressed with your pancakery! Oh so fluffy. Like lovely caroby, fudgy clouds. I can only imagine how wonderful they were, dates and all. It really reads very close to a cupcake recipe. Wonder what would happen if you added a bit more sweetener, used a bit less milk, and added a bit more carob powder, then poured the batter into cupcake cups and baked at 350 for about 20 minutes. I think I was either a victim or a perpetrator of a prank like that a LONG time ago! Carob is yummy in any context, but it is a bonus that it’s high calcium! I did think of you when I was cooking these. . . glad to add to the list of carob recipes! I realized the photo somehow made it look like lots more pancakes (the way they were cut, maybe?) so wanted to clarify. I think cocoa would taste great, actually. As to the DD story, well, we were kids, right? And I forgot to mention that they only left us there long enough to cause panic–then drove around the block and came back to get us!! How about cookies traded for breakfast? (I think I’d get the better deal . .. ). What a fabulous idea–I LOVE the addition of prunes here! (And besides, they’re great for bones. . .). Thanks for the link, too–looks terrific and I’m going to set aside some time to look at it in detail. Thanks so much for your kind wishes. And glad you like the recipe (and I think it would work with cocoa,as Johanna suggested, too. ..). I really think I need to get Dreena’s latest book, with all the good feedback I’ve heard! (And yes, the HH pokes fun at me all the time. . . but it’s all in jest, so it’s okay. I have lots to poke fun at, too!). RE: the DD story, no, not funny at the time, though at least they didn’t leave us stranded indefinitely! Funny, I didn’t realize how much dried fruit I’d been using till I read your comment! But yes, I suppose I’ve been trying to empty out a container of dates that’s getting a bit TOO dry. Glad you like this one! Ha! Sorry about the pun; couldn’t help myself. Happy to provide pancakes (and that way, at least your acronym wouldn’t have to change!). Thanks! And “crazy date-nut girl”–love it. Glad you (and the coop) liked the recipe!